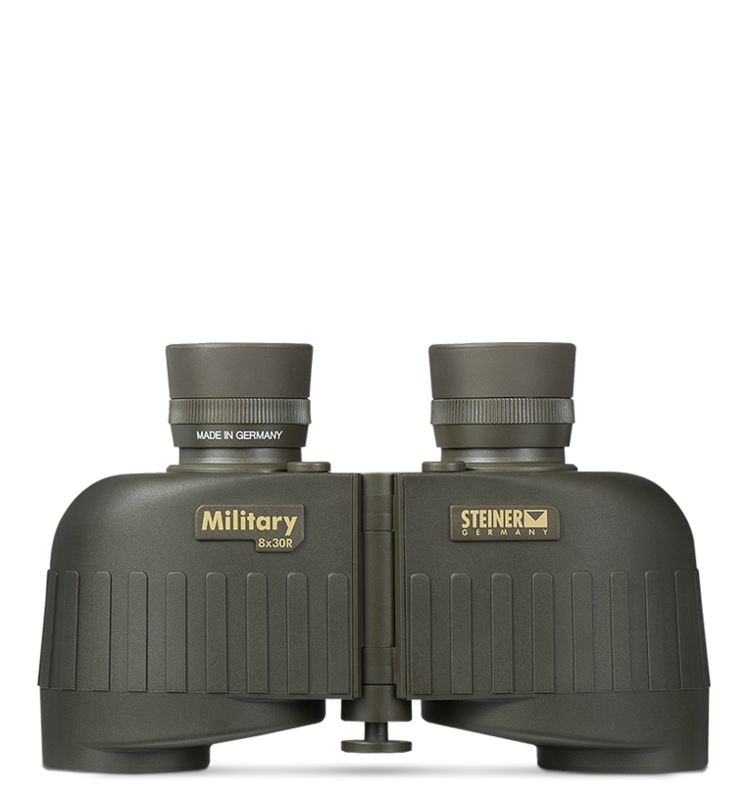 Steiner’s Military Series 8x30 is the standard binocular of many armies in the world. The Military Series binoculars are built to stringent military specifications, ruggedly designed for the fiercest conflicts and toughest environments, and have earned a reputation for performance and durability in countless tactical applications under extreme conditions. No binocular has proven its worth to so many troops in urgent situations. You, your men, and your mission deserve nothing less. Light and easy to handle, with high definition lenses for bright images and a wide field of view for steady viewing, even on moving vehicles. Includes the precision mil radian ranging reticle. to 16 feet pressurized nitrogen-filled tubes resist water intrusion even when submerged. M830r 8x30r is rated 5.0 out of 5 by 8. Rated 5 out of 5 by Jay1 from Very good build quality. I own one of these and they are exactly as the manufacturer says. They are light, compact and have excellent clear bright lenses. Excellent bit of kit! Rated 5 out of 5 by Wareagle94 from Outstanding I have had mine for 10 years. Got them as an upgrade when my MM830 were sent back for repair. Have used them in Iraq, hunting, target shooting, football game watching, at the beach. Excellent piece of Teutonic engineering. Highly recommended. Rated 5 out of 5 by pd54 from great size,very clear I had a pair of these for over 20 years and the new one is still just as great. Rated 5 out of 5 by Horticattleman from Top notch quality and service I owned a pair of these for 20+ years and drug them thru some of the roughest conditions and they were extremely durable. Finally one of the eye cups was giving me trouble. After contacting Steiner and sending them in, to my surprise they sent me a brand new pair. After 20 years of use. Amazing quality and service. Rated 5 out of 5 by Mikeacro from Perfect size and weight I recently bought this thru Amazon. I wanted something more compact than 7/50 binoculars but without compromising optical quality. these are just right! The night capability is also very good. I use them primarily on my sailboat. Rated 5 out of 5 by StacyF0427 from The BEST. Period. These are literally the BEST binoculars on the planet. They're strong and durable, and the clarity is incredible. I used these during my time in the Army, and I will never have need of another brand of binoculars. Ever. Rated 5 out of 5 by timbo from great product easy to use great feel and light weight. My Military 8X30R binoculars came with the M22 manual. Manual states laser protection and there would be a tag on objective lens. I don't have a tag there but there are numbers in that location. Do they have laser protection? Laser protection would be an additional filter you screw into the objective of the binocular. The way your sit, they are NOT laser protected. The porro prism design allows for individual focus adjustments on the eyepiece, these work in a fashion similar to diopters, but the result is yes, you will be able to focus each eye independently. when set to the right inter pupillary distance, the mil-reticle on my m830r is canted at an odd angle, is there any way to adjust this? Unfortunately, no, the Reticle is fixed in the binocular. Can I purchase soft eye caps to replace lost parts? Please contact customer service at 888-228-7747 in order to obtain information about repair is replacement parts. Hello- Does the binocular (M830r) allow me to adjust the reticle focus? Yes, both eyepieces are adjustable, and the reticle is located on the right side. How many degrees per reticle is there for the Commander XP 7 x 30 with compass? Every degree is marked on the compass, so 1 degree per tick on the reticle. It's noted numerically every ten degrees.